Designed by the esteemed architect for his own personal use, this extraordinary two-bedroom penthouse in London's iconic Highpoint II building is asking $3.89 million. 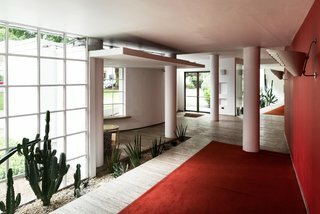 As a Russian émigré who helped pioneer modernist architecture in Britain, Lubetkin designed Highpoint phases I and II between 1935 and 1938. The building's elevated location on North Hill in Highgate was considered to be the highest in London at the time of its completion. 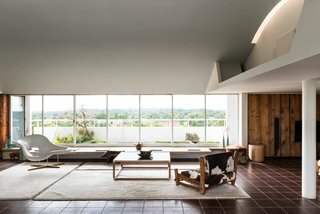 One of the best examples of early International Style in London, Highpoint has been listed on England's National Heritage List in recognition of its architectural quality. 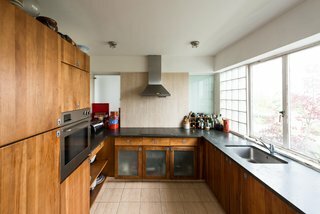 This penthouse, which was Lubetkin's former home, is located in Highpoint II, which contains 12 duplexes and was designed to be more luxurious than the flats in the neighboring Highpoint I. The unit has direct lift access from the building’s distinctive lobby and offers panoramic views of London from its extensive roof terraces. 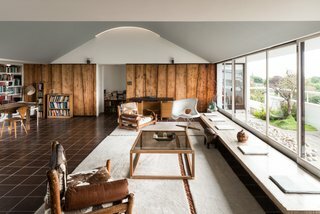 It's now being offered for £2,950,000 (about $3,885,718) through The Modern House. The unit opens to a beautifully proportioned space that measures approximately 40 feet in length. It's flanked on both sides by long stretches of fully retractable glazing and topped off with a barrel-vaulted ceiling. 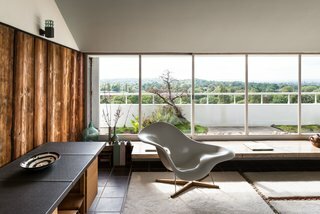 The open-plan space is loosely subdivided into living, seating, and dining areas. 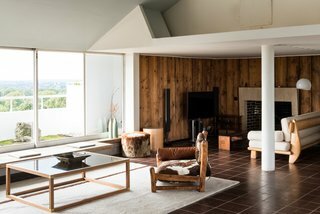 A more intimate section is positioned under a lower area of the ceiling and is centered around a board-marked concrete fireplace. 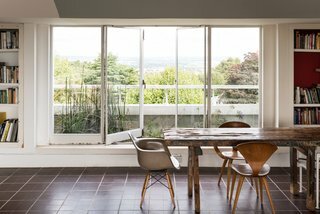 A built-in bench, cut from a single slab of travertine, creates a seat beneath the south-facing stretch of windows, which has access to a sheltered terrace. 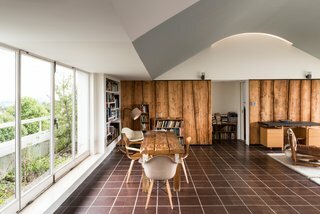 Some original pieces of furniture that were created by Lubetkin and his wife specifically for the apartment have been preserved. Carpet sections that denote the seating area are laced together with colored cord, and Victorian theater prints still decorate the wall at the entrance to the kitchen. The bathroom and two bedrooms are situated at the eastern end of the apartment, one of which has direct access to the largest of the private terraces.